CuisenaireÂ® Rods give students visual confirmation of their hands-on investigations of math concepts, from addition to division to fractions. Rods come in various lengths that can be assigned different numeric values or units of measure. 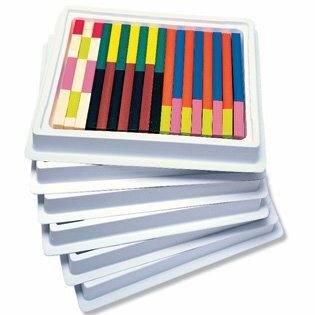 Economical Multi-Pack of wooden rods contains six sets of 74 rods, six trays with lid and Teacher’s Guide. Use with 1218 students.